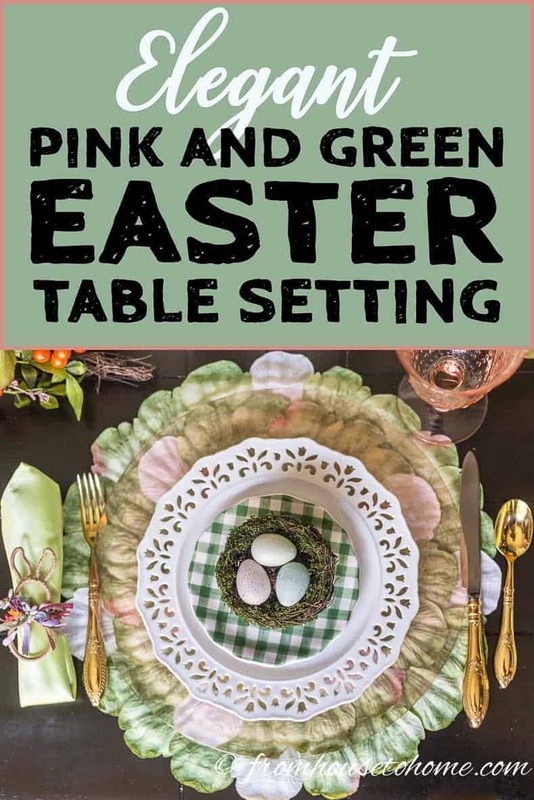 Whether you are hosting an Easter brunch or just having Easter dinner with your family, this gorgeous pink and green Easter tablescape will provide some beautiful Easter decorating ideas for your table. It’s almost officially spring and that means Easter is coming up soon! 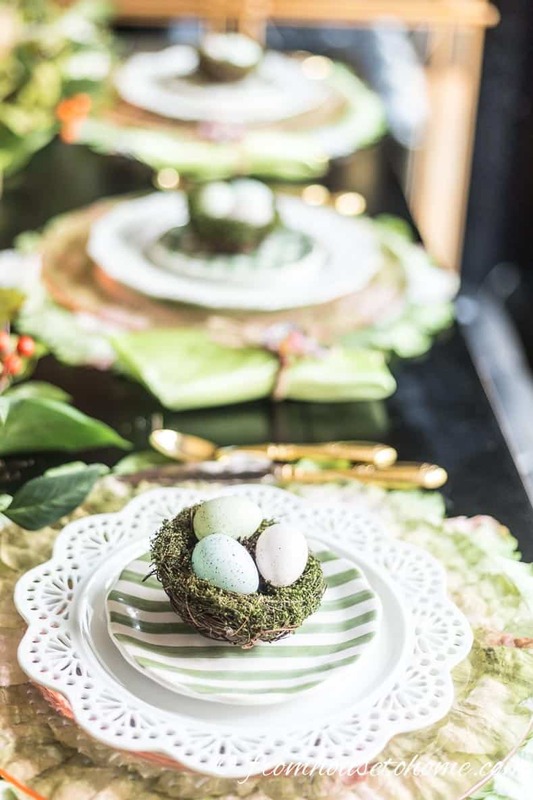 I always associate one with the other, which is why my Easter tablescapes are almost always inspired by spring flowers. And I was about to say that this year isn’t any different. But when I think about it, it actually is a little bit unusual. 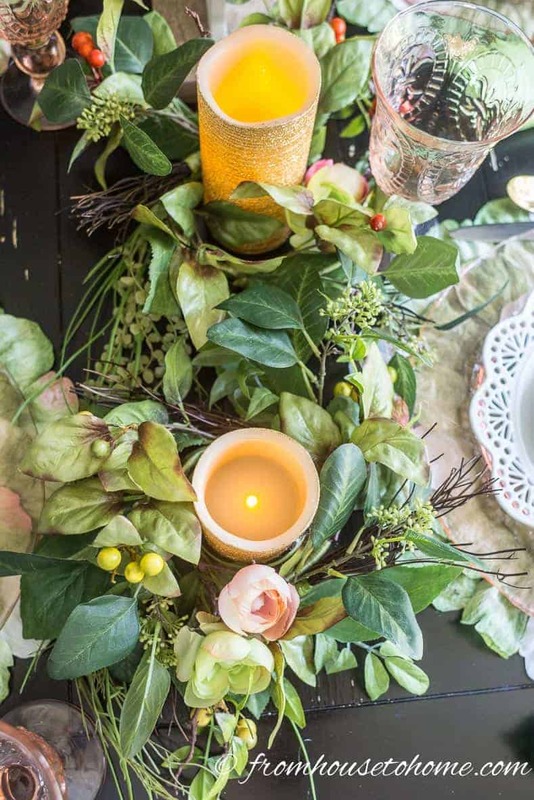 I didn’t use plants or real flowers as the starting point for my table. 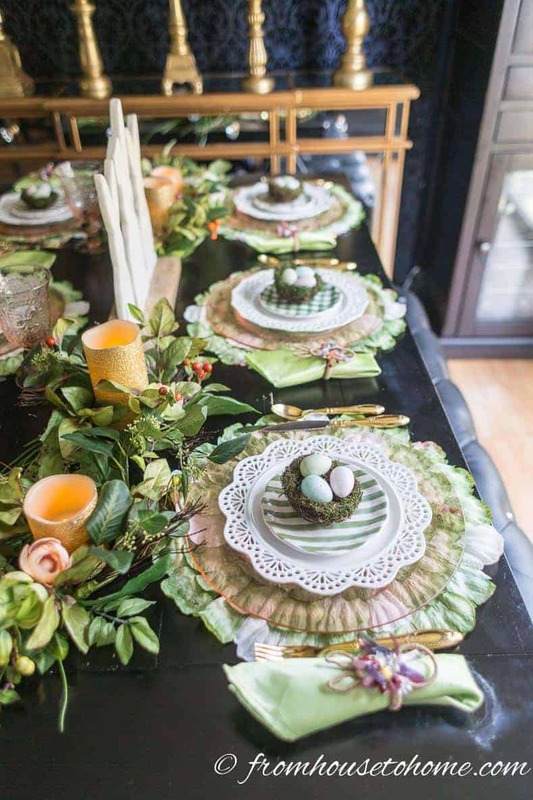 Nope…this year’s Easter table inspiration was some green and pink place mats I found at Pier 1. 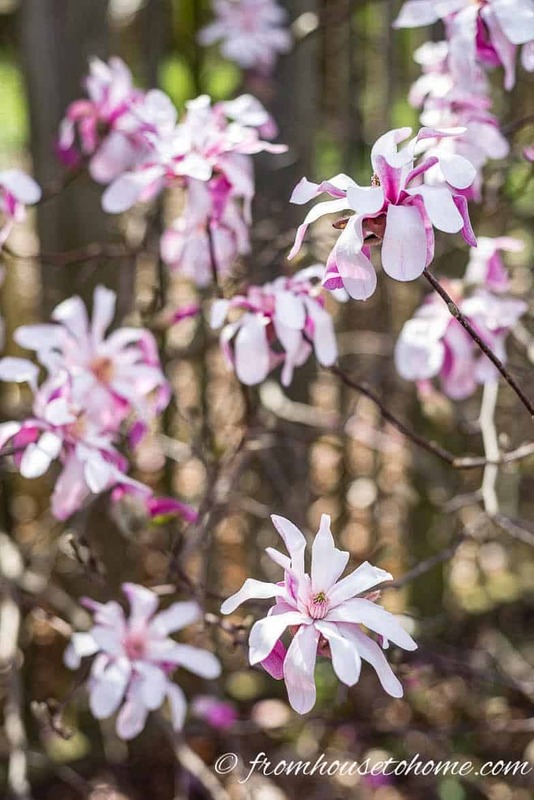 Now, the reason I had to have them was because the green and pink reminded me of early spring flowers, like the star magnolia that was blooming in my back yard. So, indirectly spring was still the motivation for my Easter decorations. But then the table kind of took on a life of its own. First, I found some beautiful pink glass chargers. 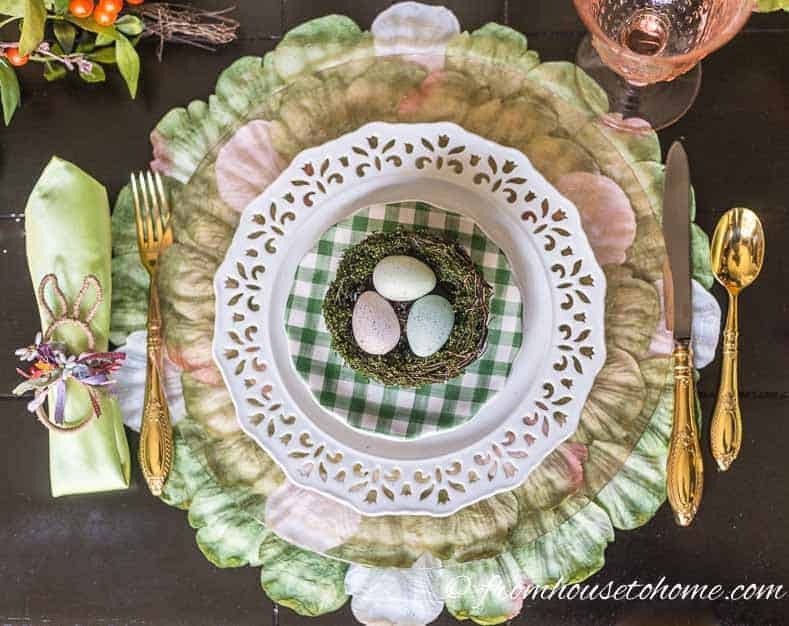 Then some really pretty lace edged plates and green plaid appetizer plates (both on the clearance rack) caught my eye. 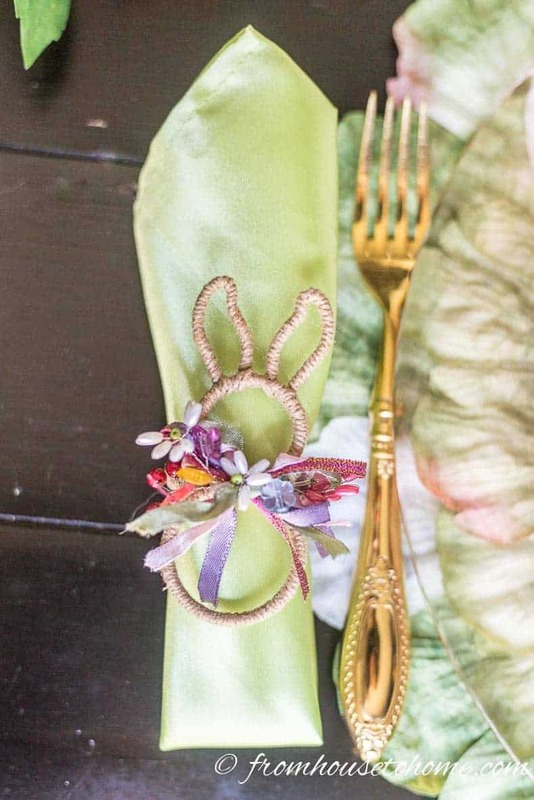 Some cute bunny napkin rings* were just the thing to add a touch of Easter without going too over the top. 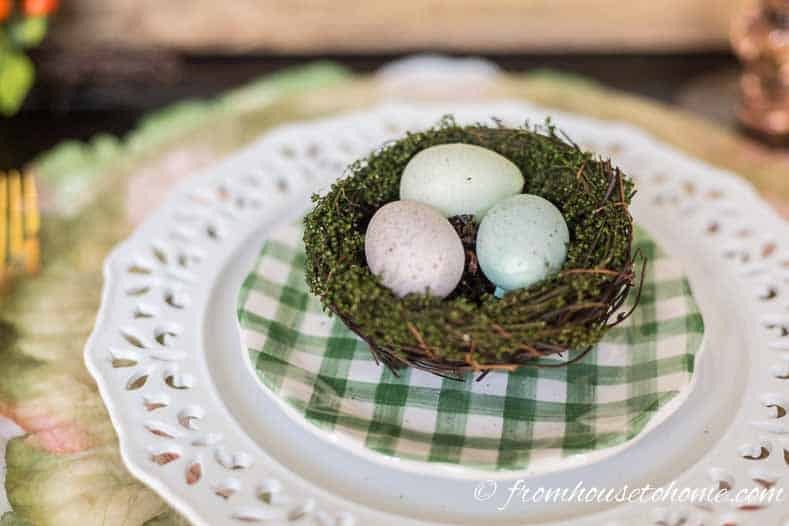 And then there were the birds nest place card holders that represented both spring and Easter. I couldn’t resist! 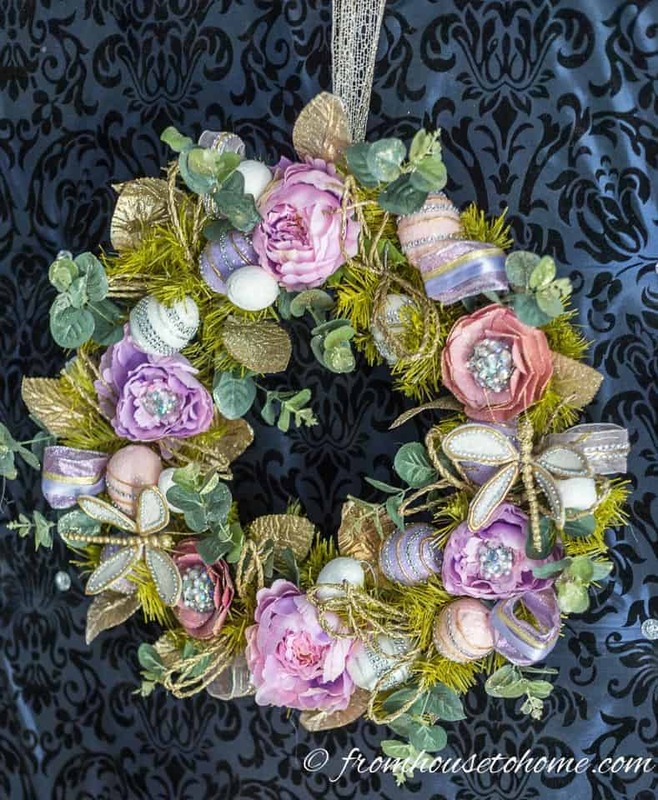 When I saw a glam Easter wreath*, I had to pick it up, too. Yes, I must have been in a shopping mood that day. By that time, I had to drag myself out of the store before I cleared out their whole dinnerware section! Good thing it was all on sale! Most of the time, when I buy a bunch of stuff like this without doing any advance planning, I end up returning most of it because it doesn’t really fit with the picture in my head. I love the way the place settings look. 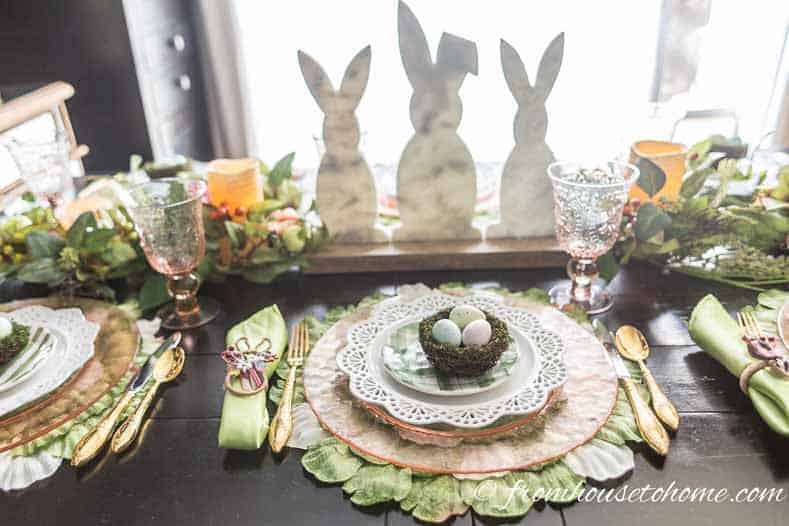 Note: I was using the birds nests as Easter table decorations on the plates rather than actual place card holders, so I removed the wire that would hold the card. But if you were having assigned seating, these would work really well for that, too. At least I already had the cutlery, napkins and pink glasses so I didn’t have to spend any extra money on those! 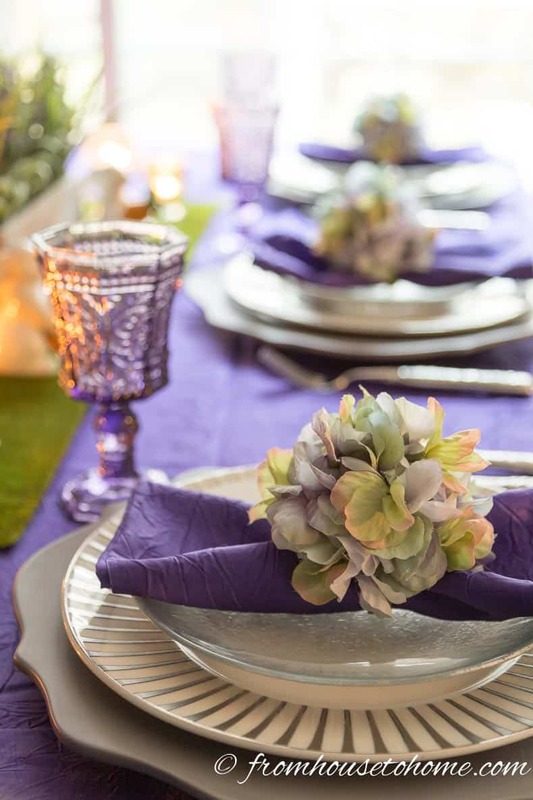 Originally, I was planning on using a table cloth, but after I put the table setting together, I actually liked it better without one. 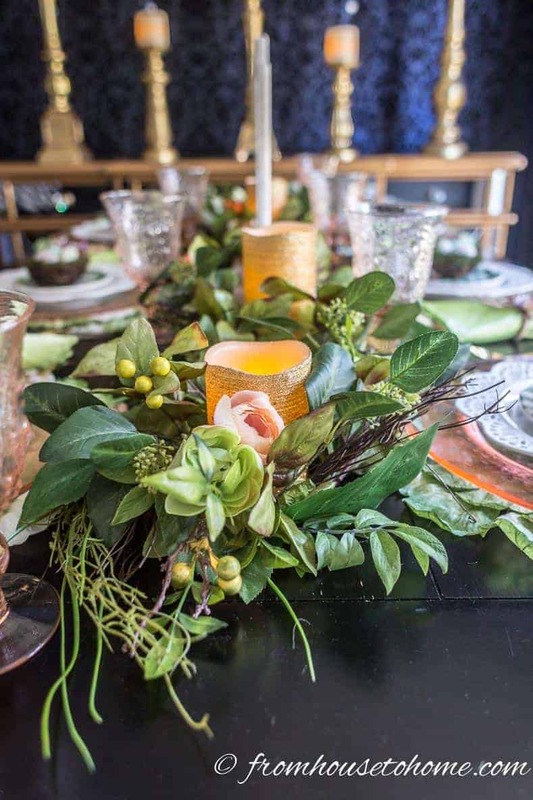 My black dining table really makes the spring colors stand out. 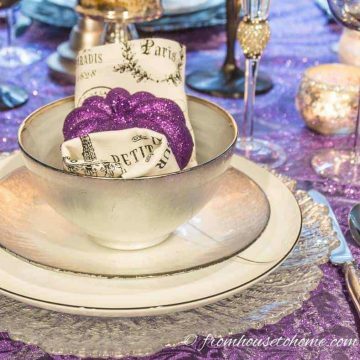 Of course, after I got the table set with all of my new dishes, I realized that I didn’t get anything for the centerpiece. 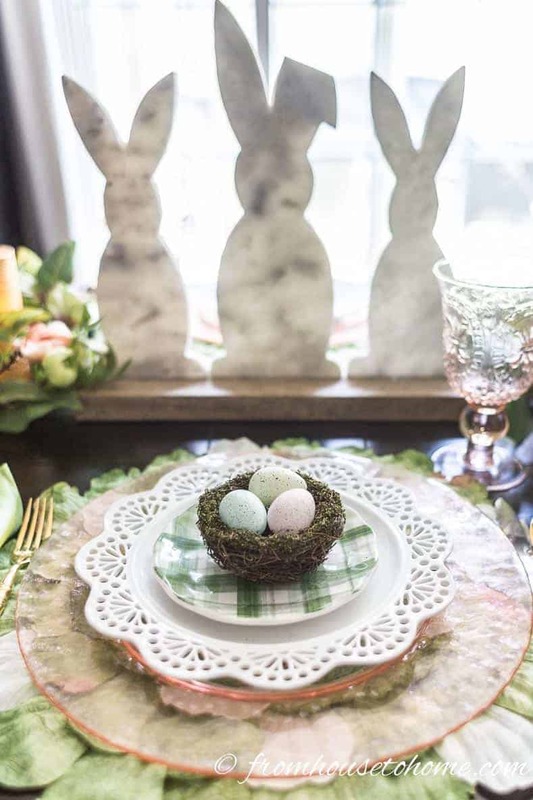 I happened to find a really inexpensive marble and wood bunny statue at Home Goods that was the perfect height for the middle of the table. 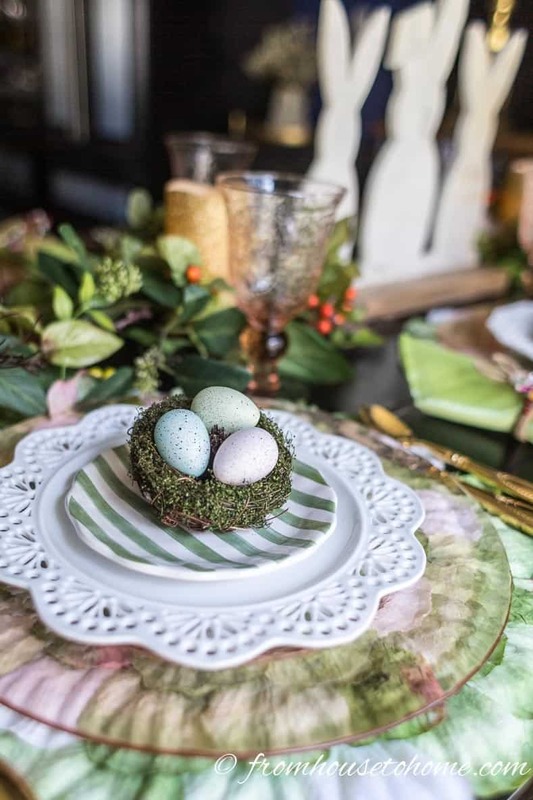 Adding some candles and greenery candle rings (that I already owner) finished off the look of this Easter table setting. You might be wondering what I did with the wreath. 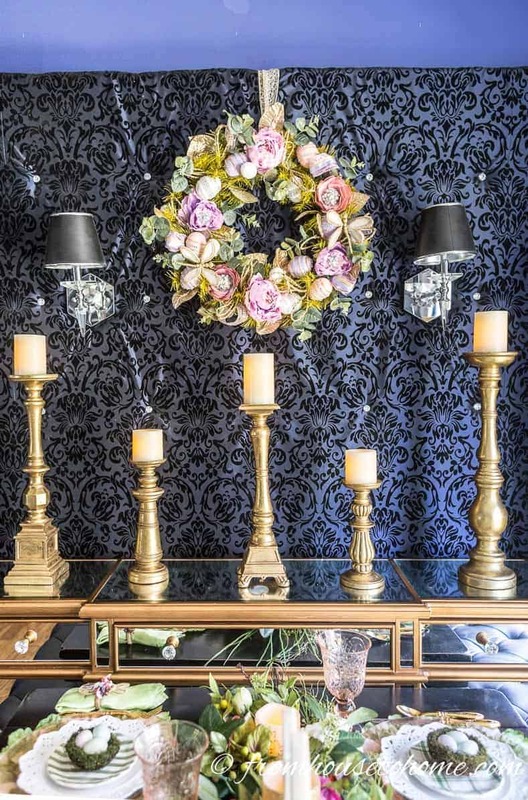 The backdrop behind my buffet is the perfect wreath-hanging location. It is such a show stopper that I didn’t think I needed to add much more. A few tall candle sticks across the top of the buffet and it was done. Now that it’s all done, it still feels like spring to me. Which is exactly the vibe I was going for. I liked it so much, I went a little crazy with the picture taking. So I hope you can bear with my while I share them. 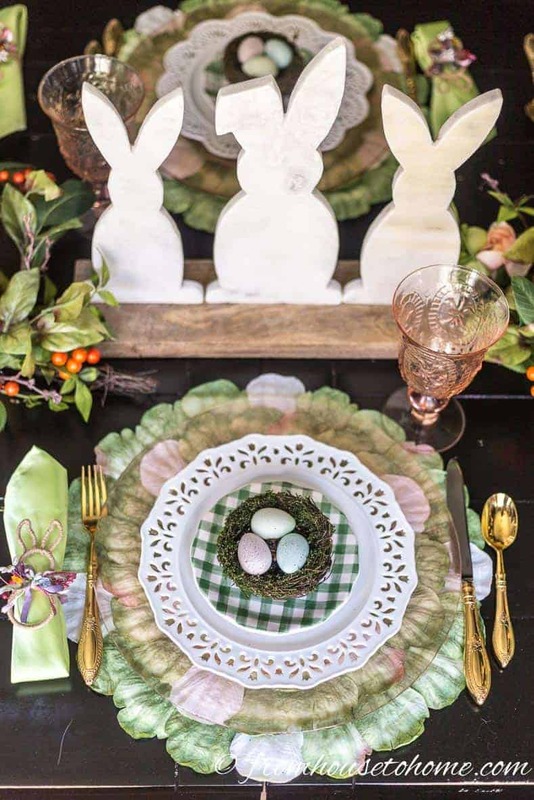 Hopefully you have found some inspiration for your own spring-inspired Easter tablescape. 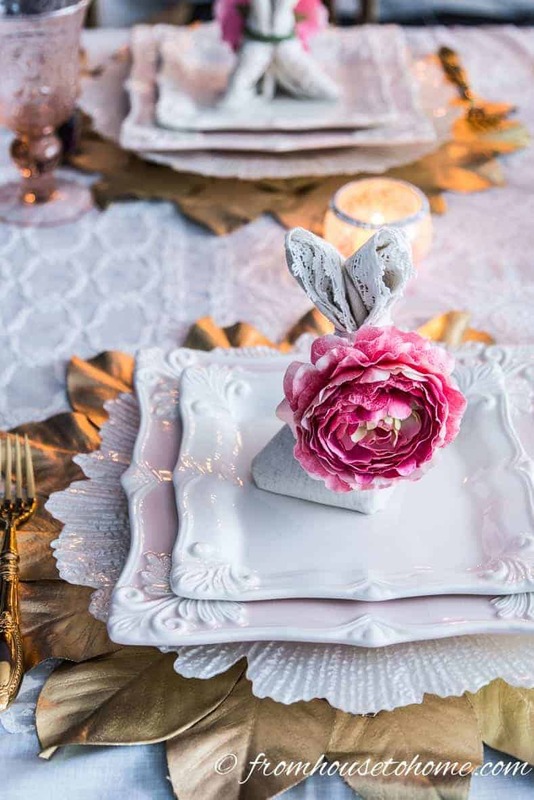 If you’re looking for more ideas, you can take a look at last year’s pink, white and gold Easter table setting. 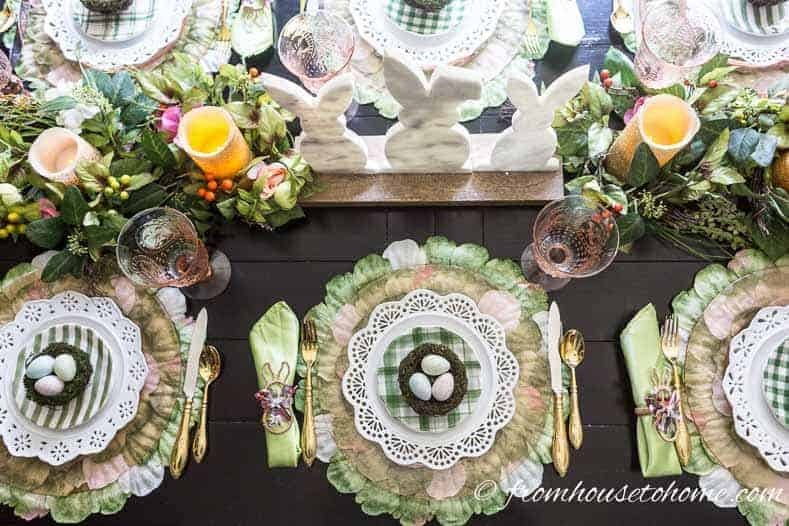 Those bunny folded napkins are still one of my favorites! 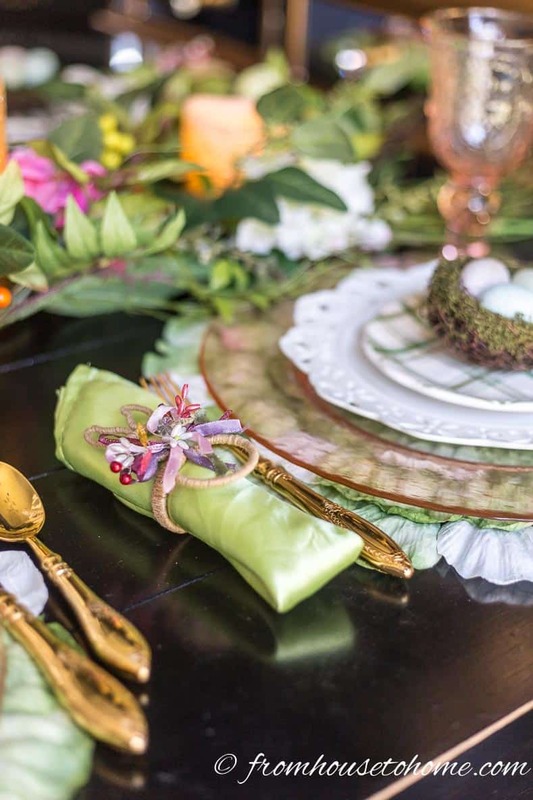 Or if you want to be right on trend for this year’s colors, this purple and green Easter table may be more what you are looking for. 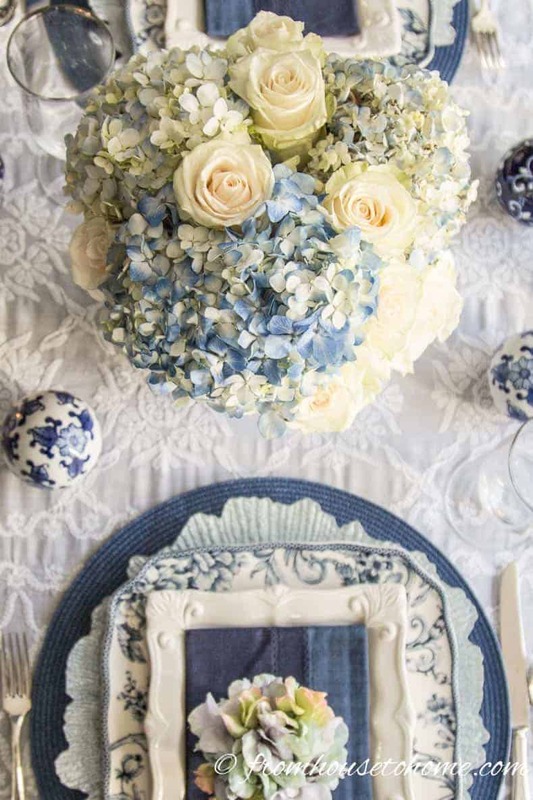 Finally, even though it wasn’t strictly an Easter tablescape, my all-time spring favorite blue and white table could be another great option. 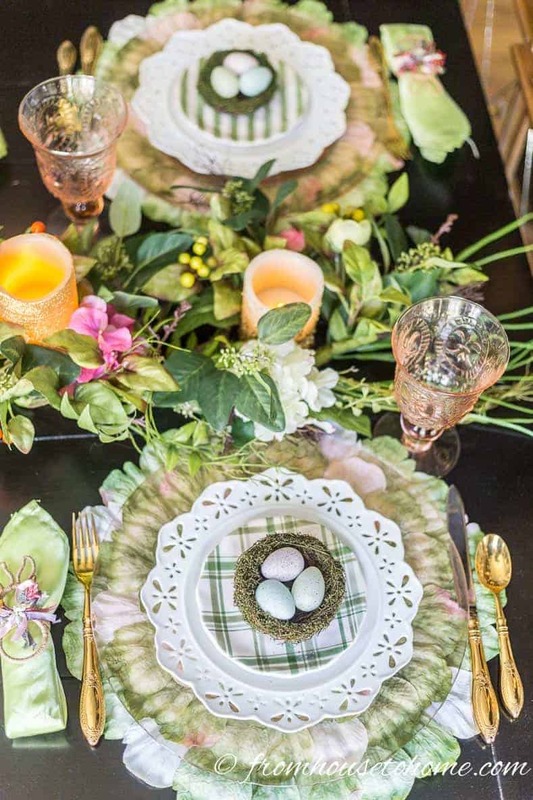 Have comments or questions on our pink and green Easter tablescape? Tell us in the section below.